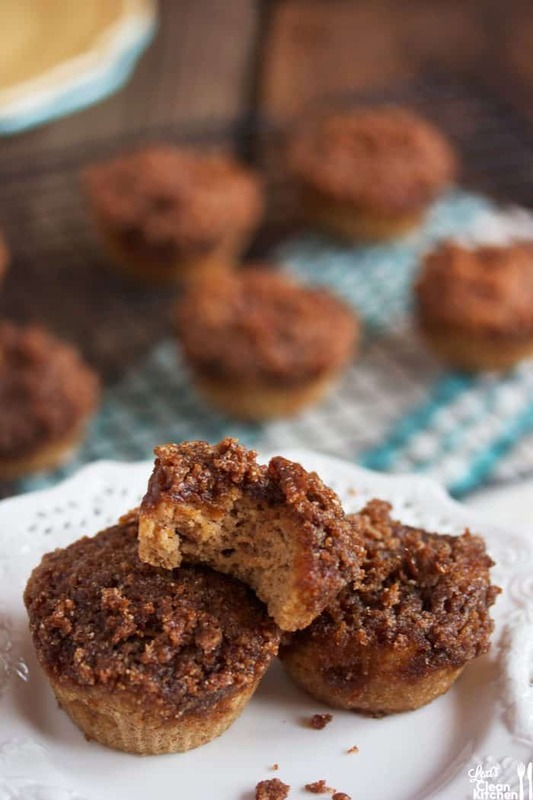 Sometimes you just really want a muffin, and coffee crumb cake muffins are just so good… every single time. 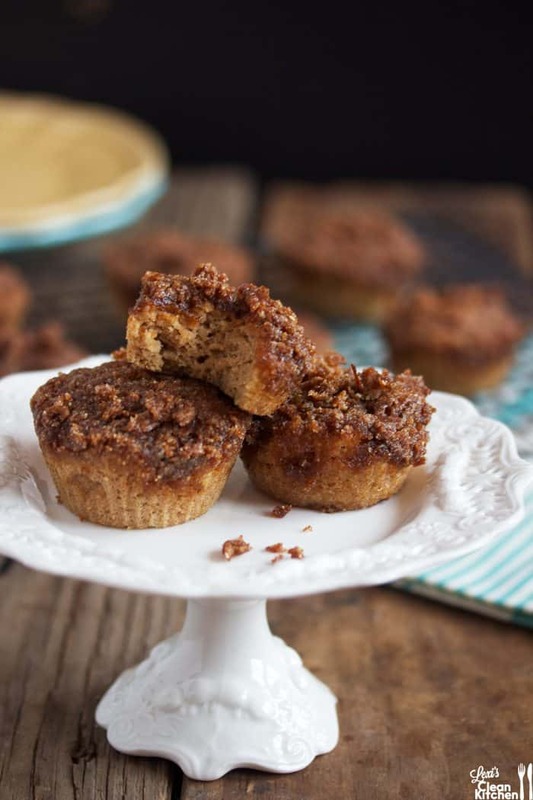 Cake on the bottom and a loaded crumbly sweet cinnamon topping on top. How can you go wrong? That’s a trick question. You seriously can’t go wrong. These were eaten in record time and more were requested. Breakfast, on-the-go snack, a night time treat, or really just for anytime of day! What is your favorite non-egg breakfast? Love the nutritional stats on these muffins compared to one you would find in a bakery or coffee shop! Pinned for later. Lexi, what if you absolute cannot stand coconut flour? Could I use more almond flour instead? Is there any substitute? Thanks! I made your Cioppino Stew this past weekend, and it was soooo good! I adapted the ingredients a bit since I’m allergic to scallops and made it in the crockpot. The result was truly amazing. Been saving a bunch of your recipes and this is the first one I tried — thank you so much for all the great-tasting, healthy food ideas! Will be making these muffins soon. When I went GF the one thing that I missed the most was my mom’s coffee cake, this looks just like them and I can’t wait to try your recipe out! Quick question: the ingredients lists cinnamon twice. Which is correct? Have I missed something…. where is the coffee in this recipe? Those look amazing! Coffee crumb cake is one of my favorites! A special treat that I love to enjoy, but do not get to have it too often! Even better that it is paleo! Yum! Thanks Lexi! Perfect! We have an absolutely amazing coffee cake recipe handed down to us from my husbands family but it is so not gluten free or paleo for that matter. Totally trying this one to see how it compares, can’t wait! 🙂 Thanks Lexi! 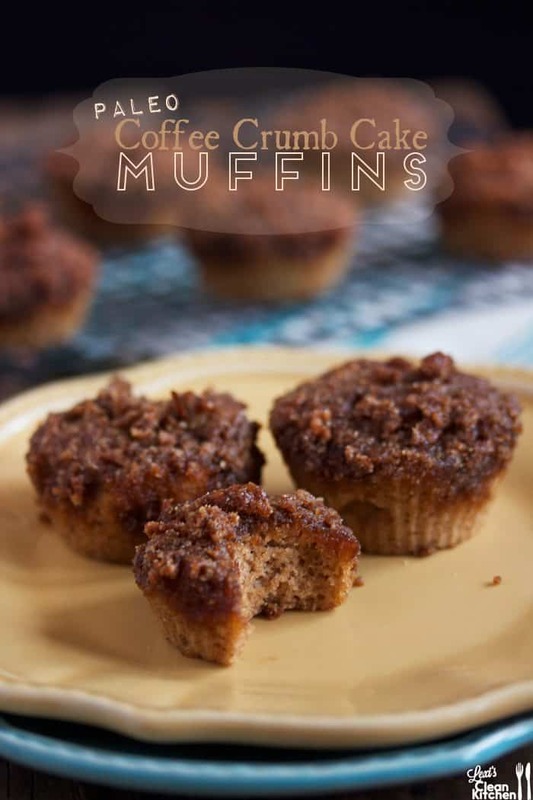 I totally love these muffins for breakfast (one of my favorite breakfast foods) or a afternoon pick me up. I know they have to taste amazing! I’ve never tried that substitution, so I can’t say for sure. Just made these…they turned out amazing! It’s so refreshing to find Paleo recipes that don’t require a million (weird) ingredients, are easy, and turn out good! Just batched cooked three meals from this webpage and they ALL turned out delicious. So grateful for your ideas Lexi. Thank you! Lexi, I love your recipes! I made these with almond meal/flour and didn’t work so well 😉 however I can’t find pure almond flour anywhere! Where do you buy yours (assuming you’re not baking with almond meal/flour combo)?? These are amazing! I’ve already made them twice. The only issue I keep having is getting an even distribution of my topping, it’s too wet to make it even and then as they cook, my muffins cave in! They still taste great but aren’t nearly as pretty. So glad I read through the comments as I was just about to make these with almond meal/flour. I had no idea there was a difference 🙁 back to the store. Hope I can find it! Yum! Pantry is still “converting” so I used sweetened shredded coconut for the topping. I made these for my daughter’s end of the year breakfast picnic, and they were a huge hit! One person told me they were the best gluten-free baked good they had ever had (and, she’s gluten-free, so it’s not like she had no comparison). I think five different people asked me for the recipe. I love that the muffin itself is not sweet, so that the buttery, sugary crumb topping is still relatively guilt-free! This post made my day, Lee! I am so glad they were a huge hit 🙂 Thanks for taking the time to write. These. Look. Amazing. Running to my kitchen right now to try them. Thanks for the great recipe! I don’t like apple sauce, can I replace it with something else? You don’t taste it. Perhaps a pumpkin puree could work, but you’d taste the pumpkin! I really appreciate when the nutritional information is included. For me it is the only way to judge how healthy the recipe is. I try to keep my carbs low. I have a weekly baking club with my 5 & 7 year old nieces. I usually let the girls pick their own recipes but today they let me pick the recipes. I am just about finished with my first Whole30 and decided I would freeze the muffins as my first treat next week. The recipe was easy to follow but I could only make 9 as there was not enough batter for the 10th one. They are on the smaller size after baking but smelled so good. My niece said they were delicious. Do I have to use the butter it called for or can I use salt free butter? Hi Lexi! 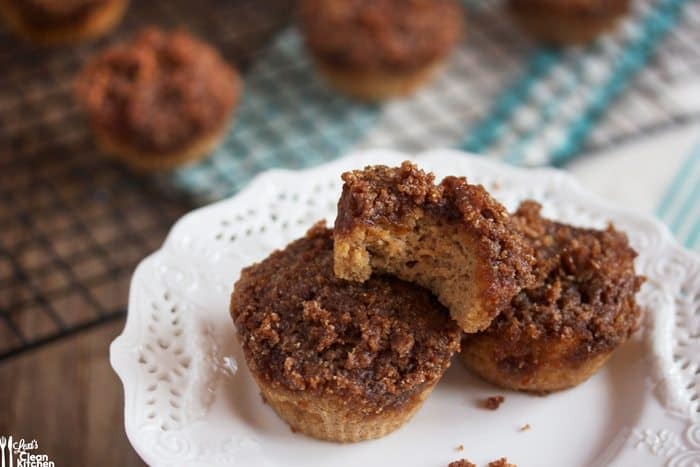 These look amazing – I’ve never made coffee cake muffins before, only coffee cake … do you think I could make this recipe in a cake pan, either a square one or a bread loaf pan? How do you think it would bake? I didn’t even come close to 10 muffins, only got 6 filling the cups 3/4 full. Am I using the wrong size muffin tin? Should I be using the mini tin? They were good anyway. Even hubby like them (he was worried when I went low carb). I think they are moister than the “real” crumb cakes I’ve made. Thanks! I love your white mini cake stand, where is it from? Thanks! Hi Lexi! 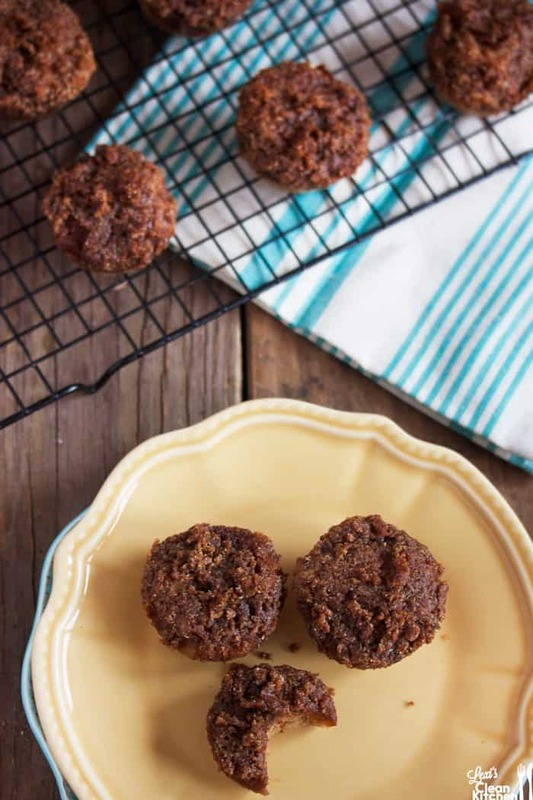 I’m dying to try these muffins but have a bad almond allergy…thoughts on substitutions? I have tapioca flour, coconut flour and arrowroot flour. Let me know what you think and suggestions for how much if you have an idea! Can you add protein powder to any of your Muffins/Donuts recipes? I want to have an extra kick of protein to these babies! I tried your protein blueberry donuts yesterday and they are all gone now! Our family loved them! Yum!! If I wanted to make this in a bunt pan instead of muffins (to make it more of a coffee cake), what would you recommend the cooking time be adjusted to? I love all the ingredients you are using but I thought I read the recipe wrong when I saw only 1 cup of flour. I had a hard time partially filling 8 muffin cups and the. The topping was way too much. Did I do something wrong?